Mahatma Gandhi’s contribution towards bringing peace and non-violence to this world is unparalleled. His teachings must be promoted to resolve current conflicts, avoid violence, find peaceful solutions and to make our world a better place to live. To keep the spirit of Gandhi’s teachings alive, the Institute for the Humanities at SFU, The Thakore Charitable Foundation, and The JS Woodsworth Chair in the Humanities at Simon Fraser University will join hands in celebrating Gandhi Jayanti on October 2nd and of this year to foster the principles of truth, justice, human rights and non-violence. The recipient of the 27th annual presentation of The Thakore Visiting Scholar Award will be Jean Augustine for her work in advancing rights for women and a strong advocate for the rights of black women. 1) The Garlanding Ceremony will be held on October 2nd, 2018 at the bust of Mahatma Gandhi located in the Peace Square on the Burnaby campus (south side level 3 of the Academic Quadrangle) from 6:45pm – 7:30pm. We welcome all those interested to attend. This event is free and open to the public. A small reception will be held after the garlanding ceremony in the James Douglas room at SFU. 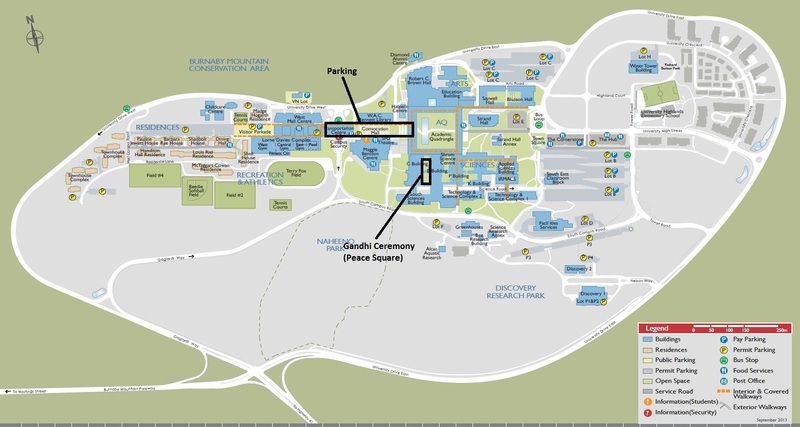 Parking details (see map link below): Guests can park for free under the Convocation Mall covered parkade. We welcome all those interested to attend. This event is free and open to the public.